Scott Barton and Jack Wilcox, co-songwriter's for Feller, an acoustic folk-rock act, find themselves trading off lead vocals and adding their own visions to each other's songs on the band's debut full-length, FUTHERMORE. A laid-back folk album, the rock still manages to take the steering wheel, allowing the band to swerve into plentiful rock beats when needed. Barton's "Me For Free" starts things off. The rock-soaked folk cut drifts along with acoustic guitars, but the vocals and rhythm section won't allow it, adding western rock credibility to the stormy song. Wilcox's "Headed West" keeps things interesting, mixing up a porch folk-funk-rocker that is as settled as the night, and just as much mysterious, too. "Medora" is quiet and windy, while the bounce of "Fine" will get you dancing. "Way I Go" draws you in with breathy vocals and the pitter-patter of the drums and then gets you bouncing as the heat is turned up. Contemplative closer "Multnomah" allows you time to sit back and think, absorbing the lyrics as well as the sincere, heartwarming melody. 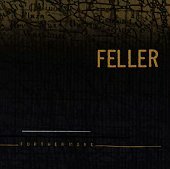 Feller's co-songwriting team helps shake things up. The songs are different, with two visions propelling everything, ensuring nothing is stale or over done. The songs are tender and crisp, and deviate enough to make you want to come back to submerge yourself deeper the next time. I'll give it a B.